Eternity Summer 2019 ~ "Inspired by the warmth of a summer afternoon by the sea, the limited-edition Eternity Summer for her is a vibrant and exotic fragrance. Dewy water lily pairs with lush and juicy mandarin on top of warm white amber for a soft and refreshing fragrance. Reminiscent of a day spent on the sand, the vibrant tones of the sophisticated bottle evoke a beautiful sunset. The exotic scent is defined by a luminous bouquet of freshness, the quintessential summery twist on the iconic Eternity. Escape in the beauty of the horizon." Developed by perfumer Clement Gavarry; additional notes for the fruity floral include pear, watermelon, peony, hyacinth, musk and sandalwood. $92 for 100 ml Eau de Parfum. Eternity Summer Men 2019 ~ "Evoke the freshness of the ocean with Eternity Summer for him. Inspired by the warmth of a summer afternoon spent on the beach, the limited-edition fragrance is crisp and sensually masculine. The fougère salty fragrance inspires exhilarating confidence. Bright cilantro and lime lend a tropical feel to a warm amber and cedarwood base, while an herby, salty accord imparts the essence of ocean air. The cool ombré tones of the bottle reflect the scent, envisaging the endless horizon. Escape to faraway sands." Developed by perfumer Laurent Le Guernec; additional notes include bergamot, sage, basil and musk. $82 for 100 ml Eau de Toilette. 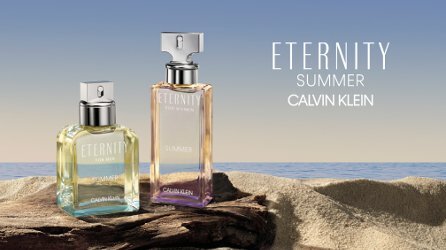 Calvin Klein Eternity Summer can be found now at Macy's. How can “eternity” have a season, summer or otherwise?